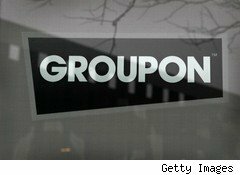 Groupon, the online social coupon site launched in 2008, is looking to raise hundreds of millions of dollars in expansion-related funding after rejecting a takeover bid from search giant Google(GOOG) worth as much as $6 billion, Bloomberg News reported Thursday, citing people familiar with the process whom it didn't identify. The company, which was valued in April at about $1.3 billion by an investment group led by Digital Sky Technologies, would likely use the money to hire sales representatives in an effort to widen its lead over competitors such as LivingSocial, which raised $183 million from sources such as Amazon (AMZN) earlier this month, the wire service said. Closely held Groupon had already been in funding discussions with investors before it started talks with Google, Bloomberg said. Groupon will generate more than $500 million in revenue this year, the wire service said, citing the same sources. Groupon, which as recently as November said it was sending daily coupons to about 20 million subscribers in 230 markets, is looking to expand to 300 markets by the end of the year, Bloomberg has reported. The company, which reached profitability just eight months after it launched, has raised $170 million from investors, among them Facebook-backer Accel Partners and New Enterprise Associates, according to the wire service.